When the cupboard’s bare on policy, a good ad man like Scomo delivers: a FEAR CAMPAIGN rivalling Johnny Howard’s “children overboard! But time is needed for repetition to sink in. And 18 May delivers … plus time for the PM’s secret weapon: prayers (even if ingrates reckon his power of prayer should be curbed after the floods in Queensland). Michael Sainsbury is back chronicling the great man’s successes to Election Day. Having streaked past Chris Watson’s 113 days in office late last year, Scott is now sitting pretty as the clear No 25 of Australia’s 30 PMs and on as of 1 February has been in office a mighty 162 days – longer than some had anticipated back of the Epoch of the Sco-Mobile, before the re-introduction of the suit and tie. But to overhaul George Reid, of the Free Trade Party who took over from Watson on 14 August, 1904, the current fair dinkum office-holder must stay in The Lodge until 18 July. And here’s the rub, a half-Senate election must be held by 18 May. In living memory, Senate elections – whether they be half or full, as was the case in 2016 with the double dissolution – half are held concurrently with elections for the House or Representatives, the majority of which determines who is Prime Minister. The House of Reps’ election does not need to be held until 2 November, under the vagaries of the Australian electoral system which are, to be frank, too tedious to be foisted upon the reader. This is getting tedious enough as it is! So the simple choice is to have the Senate election between now and 18 May and wait until after 18 July —probably some months later but Scott is a canny and politically astute leader who scored huge points from great-great-grandmothers around the nation with his caution about being properly dressed for Australia Day citizenship ceremonies. Here was a man who knows when to skull beers and scoff pies — and when to behave like a grown up. Being a grown up – and unknowing that Captain James Cook did not circumnavigate New Holland is no barrier to that, after all, Matthew Flinders was buried in London so it could not have been him – Scott has realised that a half Senate and House of Reps election at the same time is the only sensible option. Having two separate elections would not only annoy the punters but load unnecessary cost into the budget, chipping away at the ginormous surpluses – even larger than Assistant Treasurer Stuart Robert’s home internet bill – that he has promised us will be flowing very ,very soon. These are surpluses which Australia needs, not only to finance the large middle class welfare bill for Dividend Imputation, but also to lavish cash and gifts upon marginal electorates – the bribers to win over swinging voters for the Election. Yes, welcome to the Year of the Pig! Indeed, so confident is Scott of pork-barrelling millions of taxpayer dollars to get himself re-elected that he is already describing his next term as “The Re-elected Morrison Government”. Voters love an overly confident prime minister, just ask Paul Keating and Kevin Rudd. And if he keeps saying it long enough, it should happen, should it not? He will be praying for victory, for sure. Indeed, who can forget his confidence in praying for rain to end the drought — and surely enough, down gushed the waters from the heavens. As he travels through Queensland, now the clear favourite state of Australia’s political leaders, locals in Townsville, where flooding is causing havoc, will be begging Scott to pray for an end to the rains. Or perhaps to pray the rain go elsewhere, to the bits where it is burning. Speaking of precipitation, it’s been raining departures from the federal parliament. What started as a drip when the pesky Member for Chisholm Julia Banks quit the Libs for the cross-bench late last year citing bullying, became a veritable deluge of Liberals announcing their departure from Parliament at the upcoming election, including several ministers. To make matters more interesting, Banks has opted to stand against Health Minister Greg Hunt who was so eager to help Scott be rid of Malcolm Turnbull. Is Scott worried? Not on your nelly! No, he’s actually, openly, quite thrilled. It is a chance, after all, to get rid of more of those fey moderates and keep good talent like Kevin Andrews. Tony Abbott, Craig Kelly and the taxpayers’ (and Chinese Government’s) friend Stuart Robert, who really needs to stand again, so he can pull in the electoral funding to help with his internet bills. Still, Scott has bigger flying foxes to fry right now, or are they deserting rats – it’s so easy to gets one’s marsupials missed up with regular mammals in the political zoo – and that’s the effective start of a marathon election campaign. Scott had realised that the mistake his predecessor, Malcolm the Snippy Ghost, made last time round was quite the inverse of the diktat of Australia’s political commentariat — that the election campaigns were too long and that is why he almost lost. 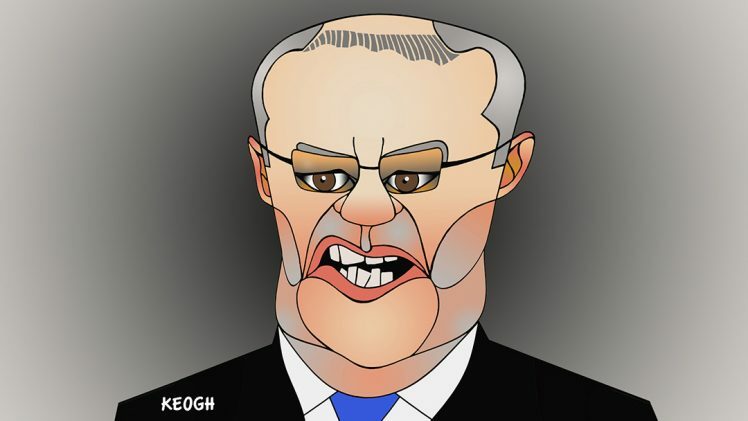 No, Scott – who come election time will still be Australia’s sixth shortest serving prime minister, a brevity unmatched by non-place fillers since the Liberal Party was formed – realises Malcolm’s mistake was not having a long enough campaign. Fear – Scott’s friend and trusted campaign strategy, after all – needs repetition and time to sink in and have its best effect. And frankingly, sorry, frankly, the taps have been tuned to full spigot already on migration, superannuation, franking credits. Scott’s profound gift of not letting truth get in the way of a good horror story is his not so secret weapon. Let the games begin. Let us pray that fear delivers us from Bill Shorten.